https://www.theguardian.com/business/2019/mar/15/interserve-to-go-into-administration-after-shareholders-reject-dealhttps://www.building.co.uk/focus/interserve-counting-the-cost-of-energy-from-waste-exit-where-did-it-go-wrong/5090378.articlehttps://www.instituteforgovernment.org.uk/blog/lessons-interserve-must-be-learnthttps://www.gov.uk/government/news/carillion-official-receivers-employment-update--5Local councils provide the services that keep our communities running. From waste collection to libraries, to the online system you use to pay your council tax or flag up a lost dog. We rely on them in hundreds of small ways every day. 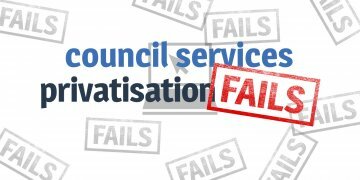 However, many of these services are now outsourced to private companies, in expensive and underperforming contracts which leave councils with no bargaining power or flexibility. In the early 20th century local councils, or 'municipal corporations' as they were then, were responsible for all sorts of vital public services, and had the power to deliver them. After the second world war, councils gradually ceded power and funding to the central government. By the 70's, 60% of local government funding was decided by the central government. By the 2000s the proportion was 85%. Without the power to decide their budgets, councils began to outsource their services in an attempt to decrease their workload. Council outsourcing, like much other privatisation in the UK, began in the 1980s under Thatcher. It started out as a Conservative ideology, but shifted into the mainstream in the early 2000s. Research in 2012 found that more than 1/3 of all council leaders from all parties believed that all council services could be outsourced to private contractors. However the evidence all points to the conclusion that outsourcing is useless. It doesn’t save money, and in fact it is usually more expensive to outsource! Outsourced contracts are also highly likely to fail - be abandoned early, or run into serious problems that affect the delivery of services to our communities. Between 2008 - 2013 councils were desperate to cut costs. Outsourced contrasts increased by 85% during this time. But over a quarter of them FAILED. And we’ve noticed. According to our polling (Survation, Nov 2015) 73% of us think that we should be consulted before services are contracted out to private companies. The majority of the country want local councils to run services as a default, only switching to private if the council fails to run the a good quality service at a reasonable cost. More damningly, we found that companies who take contracts from local councils are widely mistrusted by the public. Only 5% and 7% of people polled had a ‘high level of trust’ in the outsourcing companies Serco and Capita, respectively. Since 2018, outsourcing has descended into chaos. In 2018, outsourcing giant Carillion went into liquidation. The company had racked up £1.5bn in debts after losing money on several big contracts. 2,403 people were made redundant after Carillion collapsed. The collapse saw work being done for crucial services such as schools and hospitals delayed by months. Then, in 2019, another major ourtsourcing firm - Interserve - went into administration. Interserve's share price was plummeting from 2014. In 2018 its share price fell by 70%. Alongside this, it faced major financial difficulties due to delayed and cancelled construction contracts, as well as its bungled work in waste-to-energy projects in which it accrued £630 million of debt. The collapse of Carillion and Interserve demonstrates the impact outsourcing has on our public services. It puts them at the whims of markets and at the mercy of private companies' ability to make profit from them. We can't risk important services being subject to the kind of uncertainty they face in the hands of companies like Carillion and Interserve. Luckily, insourced council services are working brilliantly. Take Sevenoaks, who insourced all of their local services and have balanced their budget. Read more about the case for local public ownership, and find more examples of great local councils running fantastic public services in house.